Mary held her scarf in place as she tearfully ran to her brother’s house. She couldn’t stop crying. All of her dreams had just crumbled into a horrible nightmare. This was the worst day of her life. She had been a woman scorned by polite society all of her life. Most of the married women who knew her, worried about her influence on their husbands. But for the last several years now, she had been a changed woman; transformed and forgiven by the one who is called Jesus of Nazareth, the Son of God. But now her Lord was dead. The only One who had ever given her hope had just been killed. She ran almost blindly, down the darkening narrow street, nearly bumping into strangers. Her eyes focused on her brother’s house. Her pace quickened. Neighbors looked at Mary and then at each other in wonder, not knowing whether to be concerned for Mary or alarmed about something else. why was she running? She didn’t bother knocking when she got to the door. Mary only slowed her pace slightly as she shoved the door open. “They’ve killed Him!” She said breathlessly to the startled faces in the room. “Killed him? Killed who?” Mary’s brother, Nathan asked as he sprang to his feet. Mary sank into a nearby chair and allowed the floodgate that held back her emotions to open up. Tears flowed afresh. Nathan looked at his wife Elizabeth not knowing how to respond. 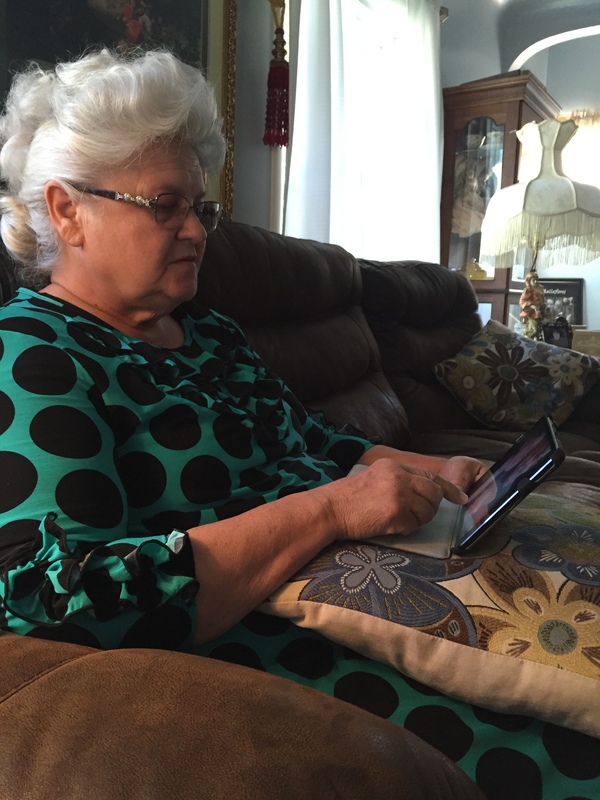 They both were happy to see the changes in Mary’s life, but they were still unsure that her attachment to this Jesus person and His Disciples was a good thing for them. “I thought your Jesus was going to overthrow the Romans and make himself king if he could get enough followers,” Nathan said trying to make a point. “You should have seen him.” Mary said, ignoring her brother’s remark. “After they had beaten him till his back was bloody, and could hardly stand, they wove a thorn-bush into a crown and then they placed it on his head smashing it down hard. It made me sick. Mary stopped to wipe her eyes again. “Then they forced him to a cross they had on the ground and while they held him in place, the soldiers drove big nails into his hands and feet. Blood ran everywhere. But He never winced or changed his expression. “I couldn’t take my eyes off of him as the soldiers lifted up the cross and let it drop down hard into the hole they had dug. It made a sickening thud, and his body shook hard. Then more blood started running down his hands, arms and back. Nathan and Elizabeth shook their heads no. They both then as if on cue, found a place to sit down as they listened to more of Mary’s story. “What did the crowd say to that?” Elizabeth asked. “They just kept on mocking and laughing at him. Some of his Disciples were standing close to his mother, Mary. “Some of his disciples? They weren’t all there?” Nathan asked with a deep furrow in his brow. “I looked very carefully, but I couldn’t find Judas or Peter anywhere. I was very surprised that Peter was missing. If he was there, I couldn’t see him.” Mary continued. “There were three big groups there today. There were his followers that were weeping, there was a bigger crowd of those that hated him and just mocked him. Then there were those that just stood on the sidelines and watched. They showed no emotion either way. It was as if they came for the entertainment. They just didn’t care. “What happened next?” Nathan asked. “Then he said to John that he wanted him to take care of their mother. He said some other things I can’t remember right now just before he closed his eyes. When he did close his eyes, it wasn’t long before his just head slumped over. “The soldiers started breaking the legs on the others that were crucified, to make sure they were dead, but when they came to Jesus, they saw he was already dead so they stuck a spear in his side. Blood and water gushed down his body and dripped on the ground. Blood and water! With that, Mary sprang to her feet and looked about the darkening room in alarm. “It’s only the middle of the day and it’s dark outside already! ”Mary said as she ran to the window. “I can see that the chickens are getting up on the roost. What is happening? Elizabeth screamed and reached for her husband as the ground began to shake violently. The dishes and furniture shook very hard. The floor moved hard up and down and the walls trembled. Cries of alarm came from homes nearby. Cracks began to show in the walls of their houses while dried dirt fell from the ceilings. Then as it had begun, earthquake was quickly over. The three stood close together unsure of what would happen next. They heard noises in the street and a man was talking very loud and very fast. Nathan went outside to see what the commotion was about. A few minutes later he came back inside. His face was ashen and his hands were shaking. “What’s the matter?” Mary wanted to know. “Rueben, the Levite said that he’d just come from the Temple and that the Veil protecting the Holiest of Holies ripped all by itself. It ripped right in the middle, from the top clear down to the bottom without anyone touching it! “The High Priest, you know, is only allowed to go in to the Mercy Seat once a year, but now the Veil has been torn. Everyone can see in there. “The High Priest and the Levites are all scared; they ran from the Temple not knowing what they should do. They were afraid of God’s judgment on them for seeing into the Holiest of Holies. There is nothing in the Law about how to correct this problem. “Two more things. Reuben said that some big rocks that he has seen in the same place for years, now are all broken in half. and no one split them. Nathan sat down while Elizabeth and Mary lighted a few lamps. “Nathan, I know you haven’t been a follower of Jesus like I have. But you know the difference and the change that he made in my life. I’m not the same person anymore. You know that. You can see that. Everyone in town that knew me before can see that. Mary started crying again remembering the moment she had knelt at the feet of Jesus in Simon’s house. She had held his feet and cried tears of repentance. She hadn’t any towel to wipe the tears away, so she had dried his feet with her hair. Then she had taken perfume, worth a whole years wages, and poured it on his feet. “I am so ashamed of my past, but He forgave me and gave me hope. Nathan and Elizabeth both nodded. Mary thanked her and looked at her brother, he nodded his approval. The three talked about the days events for a while longer before going to bed. Even after Mary had been in bed for a long time, her mind wouldn’t shut down. Then it came to her. She just could not let Jesus lay in some tomb without any ointment and spices. She knew no on had taken the time to wash the blood from his body either. That was the least she could do. Tomorrow she would make plans and find where to get the necessary spices, ointments and perfumes she would need. The next morning Mary announced to Elizabeth what she wanted to do and they went shopping for the special perfume and ointment ingredients. The buzz everywhere was about the crucifixion of Jesus of Nazareth, the sun going down early, the earthquake and the torn Temple Veil. Elizabeth wondered aloud to Mary if she thought the followers of Jesus would be safe now. They had killed Jesus. What would they do to his believers? At home that night, the special ointments, oils and spices were mixed together. A special cloth had been purchased as well. Early Sunday morning before daylight, Mary slipped out of the house and headed for the Tomb that she had heard he had been buried in. Her arms were full with the necessary items for an honorable burial. It was the least she could do. 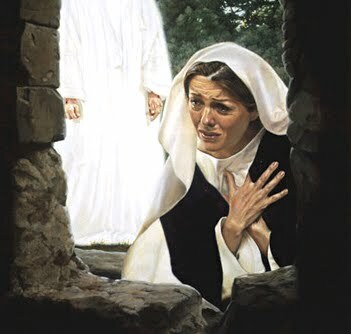 But when Mary got to the tomb, she was in for the greatest shock of her life! She arrived at the tomb while it was still dark. Yet, she could see the protective stone had been rolled away. The tomb was empty! Mary was overwhelmed with emotion, in shock she turned and started running, not quite sure where. In the darkness she ran and nearly bumped into Peter and John. “The tomb is empty, they have taken him away,” she said breathlessly! 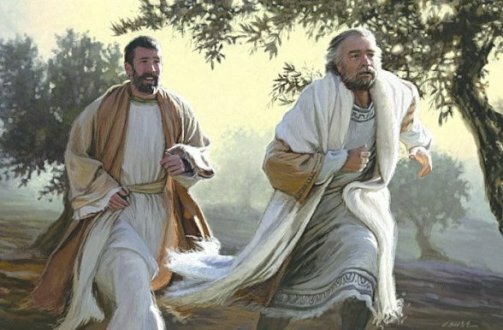 The men ran to the tomb. They had to see for themselves. When they saw it was empty, hope died in their souls and they turned and slowly went home. But Mary just stood there. She could leave. She couldn’t stop crying. She finally got brave enough to look again into the empty tomb. It was getting a little lighter by now. As she stooped down and looked into the empty tomb, she saw two angels sitting there. One sat at the head and one at the feet of where Jesus had lain. Woman, why are you crying?” The Angels wanted to know. Mary turned around with fresh tears in her eyes and saw Jesus, whom she guessed was probably the Gardener. “Why are you crying woman?” He asked. Mary still crying blindly said accusingly, “Sir, if you have taken him somewhere, please tell me, and I’ll take him away. Jesus spoke her name in that familiar voice. There was something in the way he spoke her name. It was the same voice that had spoken forgiveness to her when she was a sinner. It was the same voice that had spoken healings and miracles to the multitudes. If she knew any voice in the world, she knew that voice. She wiped the tears away enough to see him better. That is exactly what Mary did. Seeing Jesus turned her tears into joy. This is what Jesus is still doing. Let Him turn your sorrow into joy today! It’s what the hope of the Resurrection is all about! Celebrate Easter this Sunday by Receiving the Holy Ghost, the power of the Resurrection. If you do… You too will rise again! 23 Whose so ever sins ye remit, they are remitted unto them; and whose so ever sins ye retain, they are retained. He Didn’t Know Anything About Sin. The little lamb watched as the two men approached. He continued to graze as they slowly walked among the flock and took a long time looking at each lamb with a critical eye. He hadn’t been around humans very much. He knew little of them. He had no understanding of their nature. They were different from him. They were bold, loud, and they made him uneasy. He was a just a lamb. As a lamb, all he had ever known was the peace of the morning sun, and the gentle breeze of the afternoon as he napped. He enjoyed the lush green grass of the pasture and the cool still waters of the little brook. He even liked the evening dew on his back. But, he knew nothing of anything else. He knew nothing of shame or condemnation. He didn’t know the meaning of stealing or robbing. He knew nothing about hatred, or bitterness. He didn’t know about addictions or substance abuse. He knew nothing of impurity or immorality. He didn’t know about lying or deception. He knew nothing about not honoring his father or mother. He didn’t know about idols or graven images. He knew nothing of coveting or lust. He didn’t know about jealousy or strife. He watched as their eyes focused on him. Soon, the older one reached down and held him while the younger began to examine him. The lamb stood silently still as a hand rubbed down his backbone. “Perfect,” the younger man said. The hand ran down his front leg as the man continued his commentary. “He’s not bow-legged, or knock-kneed. He’s not splayed or pigeon-toed. “He’s perfect!” The younger man said again. Then firm hands held him still as the men critically examined his head. “Perfect,” the old man said. They looked at his ears, and their placement on his head. They looked into his eyes, to see if he was wall-eyed, bug-eyed, cross-eyed, blind, or injured. They also examined his eyelids to see if they worked properly. “Every thing looks perfect on his head too,” the old man said. Then, the hands rubbed down his nose, checking for bumps, lumps or dips, before pulling his lips apart to look into his mouth. They looked at his teeth placement and checked for any abnormality. “Check him for a over bite or under bite,” the old man said. The lamb felt the hands turn his head sideways as the two examined his jaw. “He’s Perfect,” the younger man said. “Let’s check him for scars, or scratches.” The young man suggested. Hands slowly examined his back, sides and legs through the wool. “He perfect!” the younger man said again. “Does he have scabies, or eczema? Oh, and check his conformation again, and look once again for any other deformity.” The older man ordered. When the examination was finished, the older man turned to his son and became serious. 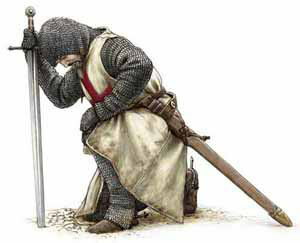 “When you go to the priest today seeking forgiveness for your sins, it will not be you, that the priest examines. He will only examine the lamb. As much as I love you son, you can’t pass inspection. Neither can I. “If the lamb is perfect, then we are forgiven! Only the blood of a perfect lamb will cover our sins. Just like in the Garden when a perfect lamb was slain for the sins of Adam and Eve. The young man picked up the lamb, held it carefully in his arms as he walked towards the Tabernacle. Old Testament – The Only Way To Remit Sin Was By The Blood Of The Lamb. 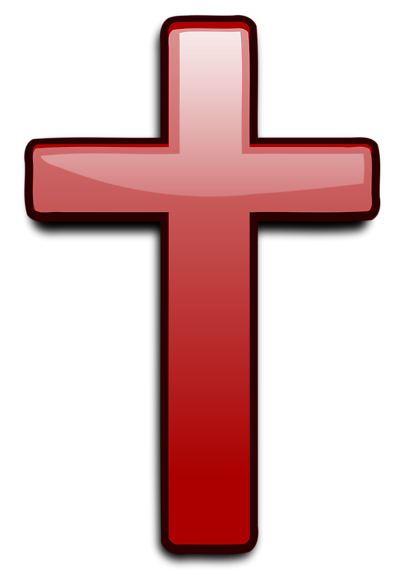 New Testament – The Only Way To Remit Sin Was By The Blood Of The Lamb. Today – The Only Way To Remit Sin Is By The Blood Of The Lamb. How Does This Story Apply To My Life Today? 1. If not, and you would like a Home Bible Study in your home, please let me know. I will be happy to assist you. 2. Also, It would be my honor to direct you to a great Apostolic church near you!